Adventure videos tend to show the real person deep down inside. The fear, the freedom, the nervousness, the excited, the passion is written all over their faces. It was easy to share my biplane flight video because there was no sound and the camera was too far from my face to see the true expressions, but my skydiving video is up close and personal. In the spirit of adventure and freedom though, I’ve actually included my skydiving video. As you watch it, try to envision yourself doing the exact same thing… preparing to jump from a plane, enduring the 20 minute flight knowing that you will be evacuating the plane before it lands, stepping toward the open door 13,000 feet above the ground, and putting your entire faith in the guy strapped to your back. I once heard a skydiving joke from my instructor before a jump. He said: “Do you know what will be the last thing to go through your skull if the chute doesn’t open?” “No, what? I replied. “Mine!” (In case you didn’t get that, I am strapped to his chest or front so if we crash, and inevitably die, his head or skull will be smashing into mine as we hit the ground.) Tell me that’s not reassuring before a jump? Have you done it before? What were your thoughts? Do you want to try it for the first time? What’s holding you back? This entry was posted in Adrenaline, Adventure, Air Adventure, California, Travel, USA and tagged Adrenaline, adventure, bucket list, Bucket List Publications, bucketlist, California, extreme adventure, photo, photography, Sky Dive San Diego, skydive, Skydive San Diego, skydiving, southern California, travel, Travel blog, travel magazine, USA by lesleycarter. Bookmark the permalink. I admire you tremendously. But I can’t even imagine myself doing such a thing. I would turn into a pillar of salt, unable to move. Frozen to the spot. Maybe in my next life. Skydiving is on my bucket list! Impressed and I have no desire to jump out of a plane. I never thought it was on my bucket list until I saw your video. I may have to give it a go! Ahhh I can’t decide if I want that one on my bucket list, but hell yeah to you for doing that! 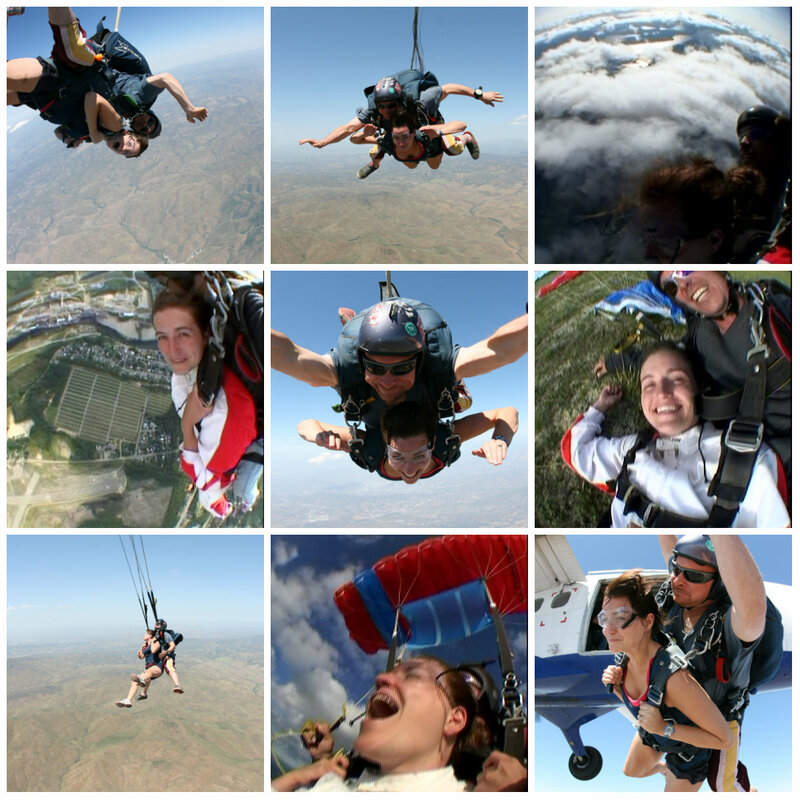 Love skydiving, makes we won’t to get the cute on and go…. Definitely on my To Do list. Almost made it at 50… with my kids. Now I’m planning on it at 60! OMG your video was awesome!!! How exciting. I can’t wait to try sky diving. The thought of it really does not scare me, but for some reason the thought of bungee jumping scares me to death. If I were to start a Bucket List I think SkyDiving would be at the top. I would be scared to death but I think I would love it. Wow, what a feeling that must be, excellent video. You are amazingly brave! Great video and enjoying watching you is the closest I will ever get to leaping into thin air! Hi I stupidly have said I will do a parachute jump for charity next may. Loved your video and had goosebumps watching it but can I ask a question..i have slipped discs at the bottom of spine …is jumping out a plane going to be a great idea and what way do you actually land on the ground????? Impressive. Not sure if I could do it though. What an awesome video! I think watching you do it was good enough for me :-). Too true, but somehow I had never seen it like this until now… big-smiling here at that realisation. Good video, thanks for sharing. Grew up in the Canadian air force, father was a Hercules pilot – started skydiving solo when i was 14… tandem when i was 12. It really, really is that first step that is all you have to worry about, cause once you jump once, it stays in your blood! I could never do that but I also don’t think I have a strong desire to. It made for an awesome video! Well done! Wondered about you in the shorts and singlet while the other guys are rugged up for the snow. Wasn’t it cold? I’ve never done it, nor plan to. Although I have written a short story featuring a sky dive which I realise now may have absolutely no believability. Thanks for sharing this with us, looks so exciting! The closest I ever did to this was jumping off a 100 foot bridge. What part was your favorite, the jump itself, being up super high or the landing? Is this something a contact lens wearer can do, or do they recommend wearing glasses? Oh dear! I felt sick in the stomach just watching your video Leslie. Fear (and fear of fear itself) is holding me back. Well done you! oops, sorry about my spelling of your name, Lesley. A day of skydiving was one of the best birthday presents I ever received. Love it! You are quite the extreme gal! I have a similar bucket list to yours, however, mine isn’t nearly as complete (I’ve been canyoning, rock climbing (gym only), white water rafting, & bungee jumping (250 ft. jump), but there’s so much more I want to do. I’m jealous! Good for you, though! Leave it to the filmmaker to ask the dorky question, but do they make individual videos for each person? Or did you bring a 1 man crew up especially to film this for you or for the blog? Soo curious as to how this video came to be! As for skydiving…. could never do it. In fact, watching the video made me feel sooo nauseated on your behalf! I’m shaking more than you were! You’re a special breed. 🙂 Also, this is the first video I’ve seen of you, and you are so ADORABLE! In your photos, you look like a model who’s endlessly brave and has superpowers, but here you just looked like a cute, regular little girl. I just wanted to hug you the whole time! Still can’t fathom how you gutsy up to jumping out of a plane though. Eek! Thank you, sincerely, for the compliments. I may make it sound like I’m brave during these adventures, but inside, I’m just as scared as everyone else; that’s why I love it so much. Conquering something like this makes me feel unstoppable in adventures and in life in general. It feeds my ambition and drive. I know that if it’s something you want to do, you are capable. I don’t ever want fear to stand in my way. I’ve done swimming with the whale sharks. It was one amazing experience. OMG that video made my palms sweat and nauseous just watching it. More power to ya though! WOWZERS! Just watching that video made my stomach clench about a million times. When I was in the military, such a short time it is barely worth mentioning, I was all for jumping out of planes. I joined the Air Force and was more than willing to be trained on it. I mean, sure, I was scared but the training and the act was for a purpose greater than myself. Now that I’m civilian, there’s no way you could get me in a plane and tell me to jump out of it. I don’t think I could do it even if my life depended on it. . . but you never know! u really brave by doing this. congrats! Thanks for sharing this experience! Even though it looks pretty terrifying – especially when you’re about to leap out of a plane for the first time – I can sort of imagine the feeling of awe and total freedom. I’d love to try this some day. I’m generally not that comfortable with heights though… Is it still scary when you’re in free fall or would you say the moments before you jump are the worst? Also, I noticed you were performing 180° spins every once in a while. Were those intentional? Can a skydiver control this at all or does it simply happen? Man! Maybe I will try skydiving…I would love to be the camera guy! Hi! I’ve nominated you for THE WONDERFUL TEAM MEMBER READERSHIP AWARD. You can read about this great award on my blog http://changeforbetterme.wordpress.com I’m nominating the blogs I thought deserved it, I do out of respect. It’s because I love how they always interact with other bloggers. Reading and commenting. They in my humble opinion represent the bloggers who support other bloggers in the best way! It is no way because I want to spam my blog, or get new readers. I really only want to honor other bloggers! Please don’t feel you are any way obligated in following the rules or doing anything other than accepting. thanks!